Richmond Dispatch, 28 October 1863. After these speeches, Colonel Pryor, an old citizen of Knox, who was under arrest, called on Brownlow, in order to induce him to effect his release from prison. Col. Pryor, who is 65 years of age, was led from prison into Brownlow’s house, expecting to secure his assistance in effecting his release from confinement. For many years he and Brownlow have been intimate friends. When the old man was led into Brownlow’s presence, Brownlow, raving like a madman, –? a pistol, declared that he would murder any scoundrel or rebel who dared to ask a favor of his hands. 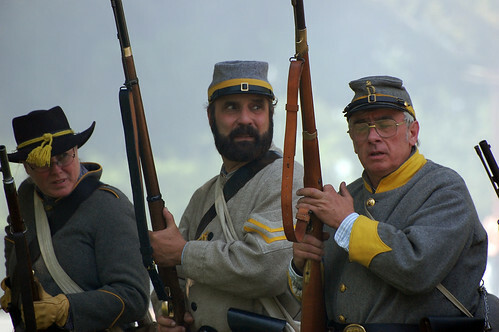 The guard interposed to save Col. Pryor’s life, and led him back to prison. This story ID’s W. G. Brownlow. If you haven’t yet figured it out, Brownlow was an “intense Unionist” while editing a Tennessee newspaper during the Civil War. (Editors Make War: Southern Newspapers in the Secession Crisis. By Donald E. Reynolds). The Union had recaptured Tennessee in the fall of 1863 which coincides with the October date which describes Brownlow’s meeting with the “rebel” Col. Pryor. 1850 Census Knoxville, page 107b, house 194, William G. Brownlow 43 editor VA, Eliza A 30 TN, Susan 12 TN, John B 10 TN, James P 8 TN, Mary M 1 TN, William O’Brien 21 printer, Francis Small 18 printer, William Neal 19 printer, Daniel Patton? 17 printer, Susan O’Brian 20, Eliza A Brown 20. I’m wondering if Brownlow became acquainted with one or more of the Pryors in Knox county through the Methodist Church. I found a reference to W. Brownlow attending a Methodist conference in 1836. James Pryor of Knox county was a known Methodist minister. He was counted on the 1850 Census in Dallas County, AR at age 60. (Brownlow was counted on the 1850 Census in Knox Count and his age was 43). In 1863 James Pryor would have been 73, not 65, and there’s no evidence that he was in TN during the Civil War. Sometimes I cringe at the antics of our Pryor ancestors. Impassioned by the start of the Civil War in April 1861, Richard Pryor in Mississippi put a price on Lincoln’s head (see ad). I’d like to know if that was $10,000 US cash or Confederate funny-money. If that was in US dollars that was quite a sum 150 years ago! I WILL give the above reward for the head of ABRAHAM LINCOLN. If taken a live, or 50,000 if taken dead and delivered to me at Vicksburg , in time for me to hand it over to President Davis, by the 4th of July, next. All the papers please copy. Who was this Richard Pryor? Probably this was the Richard S. Pryor, son of William B Pryor, who lived in Madison County. LA (1850) and in Warren County, MS (1860). Vicksburg is in Warren County. Mary Pryor and Lodrick (or Ludwig?) Garrett of Overton Co. I found a terrific record for the Pryors in Overton Co., TN. It’s a Mother’s Application for Army Pension (file number 116383) which was filed by Mary Garrett wife of Loderick Garrett, or in this application it is spelled at times “Ludwig”. The application was made 9 Oct 1867 for the pension of their son James M Garrett. To date I didn’t have a James on Mary’s family group sheet. I believe he is the son named “Marion” who was on the 1850 and 1860 Census. If so, James Marion Garrett was born about 1836. We now have a marriage date for Mary Pryor (daughter of Spicy Taylor and William Pryor): Mary Pryor to Ludwig Garrett, married by Joel Parris, a justice of the peace, on 15 Nov 1831 in Overton Co., TN. Witnessed by Robert Barnes and Calvin H. Cope. This is from the sworn statement given by Robert Barnes and Calvin H. Cope who state they were at the wedding. A quick connection… back in 2011 I wrote about William G Pryor in the War of 1812 with Joel Parrish and that he lived near him in Overton County. Is this the same man who performed Mary Pryor’s marriage ceremony? John Padgett and Elizabeth Rome completed an affidavit that they were acquainted with Mary Pryor and her family. Witnesses on additional documents: Julia Ann Owen, Dolly Taylor, James Amonett, Eliza A Beaty. Although Loderick Garrett wasn’t on the 1870 Census, he was living at the some of the papers were completed in November 1867. Mary Garrett died about 1899 when the pension was dropped off the rolls on 30 June 1899 due her death. I found some great stuff in the Fold3 Military Records. It has been extremely useful for one Pryor line that seemingly evaporated from census records in 1850 and 1860. Last year I wrote about the family of trombonist Arthur Pryor of St. Joseph, MO (see June 9, 2011 post). This year I’ve filled in some of family connections with the help of Fold3 and other researchers. Arthur’s grandfather , the patriarch of this Pryor line, was Denard Pryor born about 1805. One researcher posted online that they found Denard in “Guilford Co. North Carolina Apprentice Bonds & Papers 1817 – 1870.” On 20 November 1820 Denard was an orphan and was apprenticed to Andrew Waggaman. It doesn’t say if he was apprenticed to learn a trade, however Alson Pryor (possibly a brother) at age 13 was also an orphan and apprenticed to John Waggoner on 5 April 1820. Alson may have been apprenticed as a tailor as that was his stated profession on the 1850 through the 1880 Census. Denard Pryor is on the 1840 Census in Clay County, Mo. He was probably married (there’s a woman in the household who was about the same age as Denard) and there were 8 children in the household. Denard was the father of bandleader Samuel D. Pryor of St. Joseph, MO (father of trombonist Arthur Pryor). There are accounts of Samuel living in Nebraska and earlier in Texas, however I haven’t found Denard on any other census. If you find him let me know! There was also a Thomas Pryor on the same page of the 1840 Census of Clay Co., MO. An Ancestry family tree shows Thomas born also in Guilford County, NC, so perhaps there is a relationship between Denard and Thomas. Thomas was deceased by 1850; his widow and children are on the 1850 Census in Lawrence Co., MO. Death Notices in St. Joseph newspapers also helped to determine which Pryors were children of Denard—they were often clear that the descendent was related to musician Arthur Pryor. Military records were also helpful in determining who were Denard’s children. 1. James T. Pryor b. 1830 in NC, married Julia Ann Lewis and settled in St. Joseph, MO, working as a well digger. 2. Emsley R. Pryor b. 1831 in NC, married Caroline Self and settled in St. Joseph, MO, working as as a well digger. 1890 Census states he served as a bugler during the Civil War. 3. Alfred “Burton” Pryor b. 1835 in MO, married Mary “Polly” Portman and died in Denton Co., TX. His son Frank Hickman Pryor worked as a piano tuner in Denton Co., TX. 4. Robert Pryor b. 1841 in MO, married Mary — ?, living in St. Joseph, MO in 1860 and 1870. 5. Samuel D. Pryor b. 1844 in Clay Co., MO, married Mary Coker, settled in St. Joseph, MO. Musican and father of Arthur Pryor. 6. Alice Pryor b. 1846 in TX, married John J. Hughes, settled in St. Joseph, MO. Again, there were 8 children in the household in 1840, so there are still a few missing from my list. Burton Pryor born 1835 is definitely a son and possibly Alson Pryor who registered for the draft in St. Joseph. I like Alson as a possible son, perhaps named for the brother who was apprenticed with Denard in NC. Denard’s and his sons’ military service was interesting. In February 1862 Robert, Emsley, and James Pryor enlisted in the Union Army in St. Joseph. A month later their father, Denard, enlisted. Denard fudged his age, stating he was 45, although he was closer to 55 years old. By April 1862, Robert and James had deserted and weren’t arrested until 1864—They were turned in by an informant, arrested in New Jersey and transported to Leavenworth, KS (yes, the federal prison!). Denard was in the army little over a year—in May 1863 he was discharged due to “age and drunkenness.” Burton Pryor registered for the draft in St. Joseph in early 1863, however in May he had been arrested for “disloyalty” and posted $1000 bond and signed an oath of allegiance to resolve his problems. I’m guessing that ID’ing soldiers wasn’t an easy task in the pre-computer age—Burton enlisted in a Colorado company using his own name in December 1863.